A very hardy tree that tolerates poor soils, hot dry conditions as well as high winds, Pinus halepensis is also useful in coastal conditions. 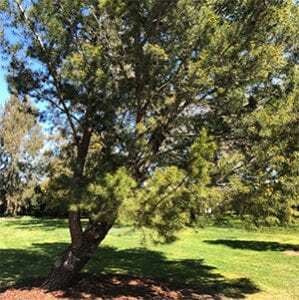 Widely used as a windbreak tree in difficult areas, this is also the the tree that is famous for the sub species Pinus halepensis brutia, better known for the Lone Pine of ANZAC memorial fame. This is a tree that grows well in low rainfall areas. Once established it requires very little care at a all. After planting water in well and much around the plant to help maintain a cool root run. Provide some additional water through the first two summers or any long dry period. Generally not required as the tree has a good growth habit. Remove any dead wood as required. Lower limbs can be removed if need to raise the canopy for access. Possible from both cuttings and from seed. 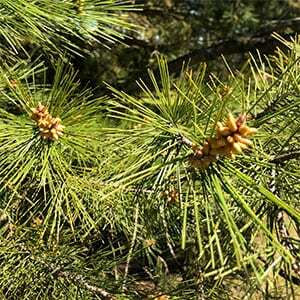 Common Name -Aleppo Pine, Jerusalem Pine.